I have the amazing blessing of staring at these gorgeous boys all day every day. Man, it’s a great job! I love it that even when Jack is trying to get his way or *gasp* be manipulative – THIS is the face I see. It just kills me! I love how he adds syllables to words that he is learning like when he used to say “Thomas the Tanken Engine” or now when he says “Limeanade”. We do what any good parent does and instead of correct the mistake, we use the proper words as often as we can but then get a little sad when he starts saying things the right way. I love that he loves babies and if they are crying he will go up and say “coochie, coochie, coo” to them until they laugh. I love that he still needs to cuddle with Mommy a little after his nap and get a little sad as the cuddle time shortens a tad each day. I LOVE when he says “I love you, Mommy” totally at random and “just because”. Most of all, I love that he loves God. The other day we were leaving the house and were running late. I was in a very crabby mood and was not being the most patient mom in the world. In the midst of us racing to the car and my constant “HURRY UP, JACK!”, he heard a firetruck siren. 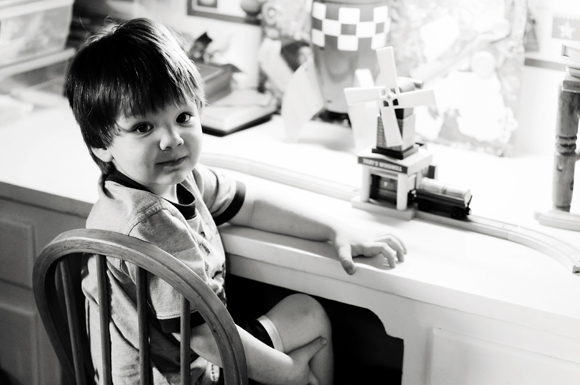 He stopped in his tracks and said, “Mommy – stop! Let’s pray!” I LOVE THIS KID!! Colin! My baby! I love your chunky thighs!! I love that you were so patient with Mommy as we figured out how to chuck you up and give you your “beer gut”. But I also love how sweetly and happily you nursed for 7 months. It was our special time. I almost can’t stand your constant smiling and excitement at just about anything. 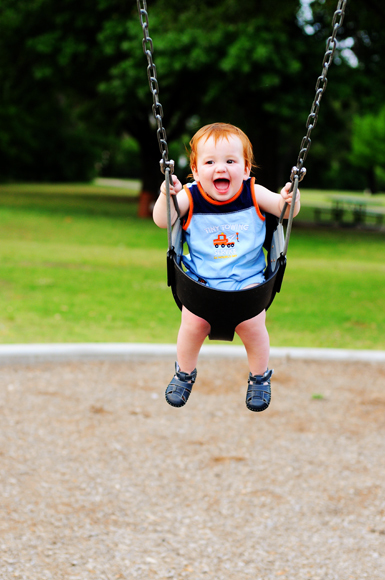 I mean, what kid is THAT happy all the time? I love your amazing red hair and brown eyes. Man, I hope the red stays! I also love that it looks like you might be getting little curls in the back. I love that you are starting to finally use your signs. Your favorite is “all done”. Of course you sign it by waving your arms like a bird trying to take off – but I get it and it’s adorable! It might not seem like it, but I love it when you call me “Na-Na”. You can use your own words, it’s ok! I adore the fact that you think my camera is just HILARIOUS and will smile and laugh when ever I get it out! Man, you make my job easy! I love the instant smile and joy that comes across your face whenever I sing “You are my Sunshine”. You have been that way since I can remember. You are a precious child of God Colin! 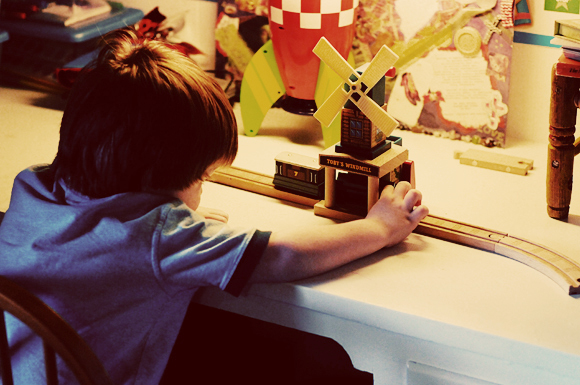 Wow, Jack really did it – he earned Toby’s Windmill!! Ok, so there might have been a TEENSY bit of help from Mom. I searched and searched for a used one but it was no where to be found so I settled for a new one on sale – $10 off – on Amazon. In the end I learned a valuable lesson here too. I learned that I need to not encourage him to save for such large purchases ($30) AT THIS AGE. 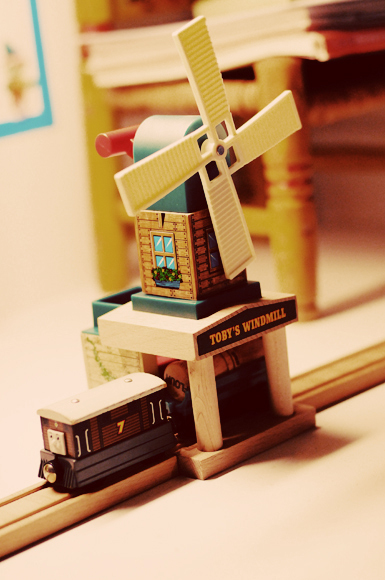 He worked and worked for Toby’s Windmill but because of the cost and his lack of understanding of how much a dollar is worth, he started to lose interest and had a hard time keeping his eyes on the prize. I need to encourage him to work towards smaller goals so the reward comes a little quicker. I am NOT all about immediate satisfaction but at three I think he needs to see results a little quicker to really get the point. Am I way off on that? Please tell me if you think I am. Seriously - I am trying to raise a hard-working, selfless kid here – I need help!! Since this was a first time thing for us we kind of made up the rules as we went. First rule was, you have to start and finish a job before any money is given. Second rule was that he would not be paid for any job that involved him cleaning up his own messes. For example – he must clean his own toys up every night, help make his bed, clean his room, he helps take dishes to the sink after he eats etc. I believe that there are things you do as a member of the family that you should not be paid to do. He was paid to do jobs that Mommy or Daddy would ordinarily do like watering the plants, picking up sticks before Daddy mowed, helping bag grass, sweeping the kitchen or living room etc. I think he really *got* the idea that Mommy and Daddy aren’t going to just buy him every little thing he wants and more importantly that he is not entitled to anything other than parents that love him, a roof over his head, food in his tummy, clothes on his back (used at that!) and a God that loves and adores him unconditionally. Toys and *stuff* don’t concern God in the scope of eternal life, but he does listen to and know the desires of our hearts. 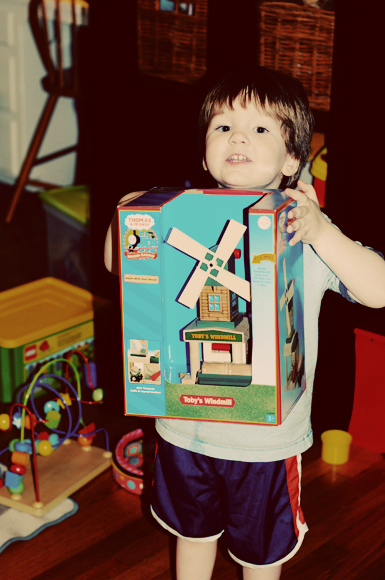 And in this case – He heard Jack’s cries for Toby to finally have his windmill! I’m proud of you bud!! You EARNED that!! You’ll be next C-boy! Won’t be long until we put you to work too! LOL! Oh, and I wanted to mention that a month or so ago Jack and I cleaned out his toys and filled a huge bin. He wanted to give them away to kids that didn’t have toys. Well, the bin has been in the garage all this time waiting on Mommy to figure out where we would take them. Today, sadly, the perfect recipient landed in my inbox. A family at Jack’s preschool lost their entire house and all of their belongings this week due to fire. The family has three kids- 2 girls, 6 and 4 and a 2 year old boy. We feel so blessed to be able to give our toys to this family and try and give them a small shred of joy in this horribly hard time. Kinda makes a windmill seem silly, doesn’t it. I also plan to donate my income this weekend from my photo sessions to them. It isn’t much, but we have more than we need and it is the least we could do. Lord, be with them and show them your peace and mercy. 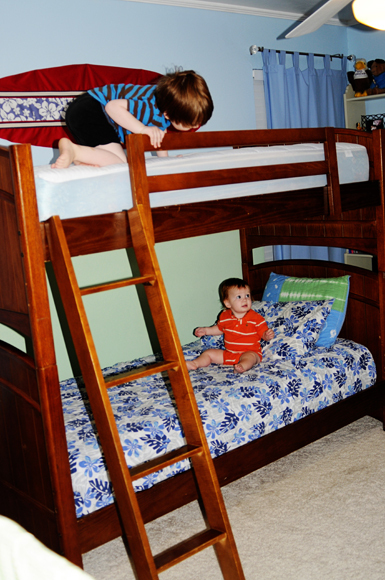 Knowing that Jack moved out of his crib at 20 months, Alan and I knew we still had some time to find bunk beds for the boys but, being the planner that I am, I started looking early. 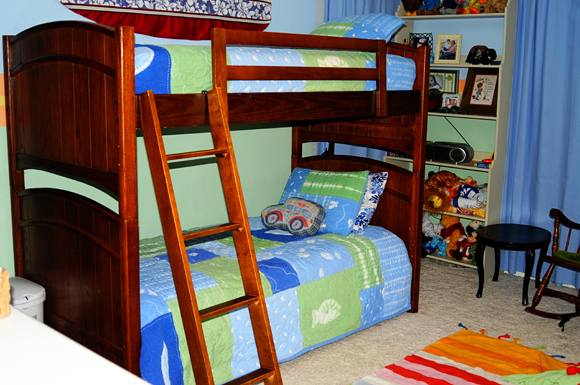 Every week or so I would read down the list of used bunk beds on craigslist. I saw a few I really liked but didn’t want to drive 80 miles to look at them, a couple I LOVED but couldn’t afford and many that were just downright tacky. 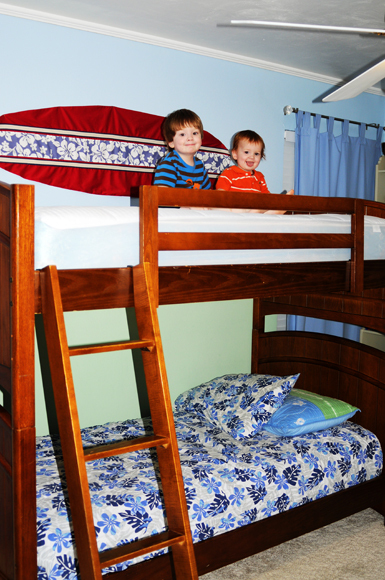 Since I wasn’t in a hurry, I could wait for all the pieces to fall into place to find just the right beds for the boys. I happened to look again on Friday night when I couldn’t sleep and found a set that were near-by, looked solid and sturdy and were in our price range. We went and looked and were happy to find that although they were 10 years old and a little scuffed up, they were solid as a rock and real wood! We haggled a bit and got a better price too – which is always a plus. Alan wanted to set them up right away, so we set to it. You might remember Jack’s old day bed. Poor kid had to sleep on this girlie day bed for almost two years. I think he survived with little to no long-term damage. 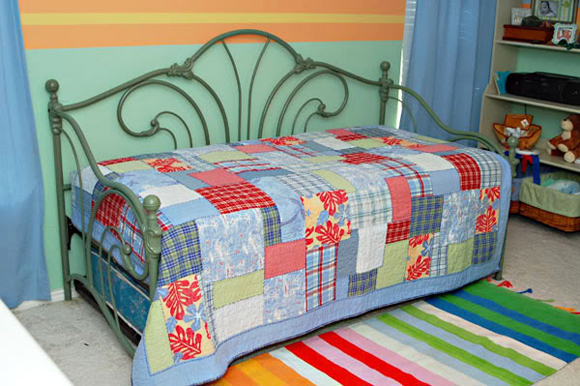 This bed was a pre-Jack craigslist find when we needed a bed for our then guest room that didn’t take up too much space. It was then turned into Jack’s big boy bed. 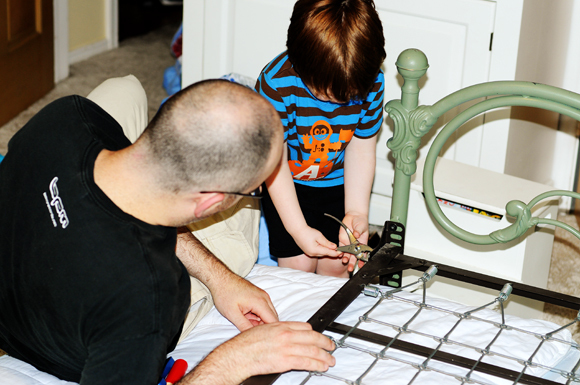 Jack wanted to help Daddy take his old bed apart. 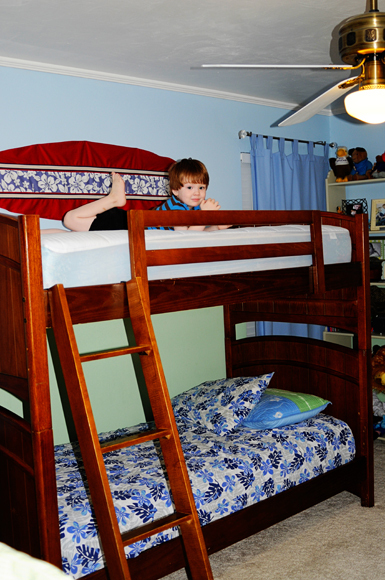 Here is the big boy testing out his new bunks! Before you go on – notice the ceiling fan in the above picture. ACK! 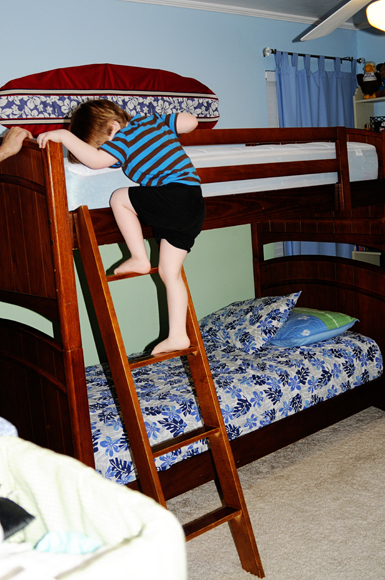 Yes, it does overlap the bed and does come dangerously close to the head of any person on the top bunk. We will be replacing that fan soon with a flush mounted fan with shorter blades. You can breathe again. 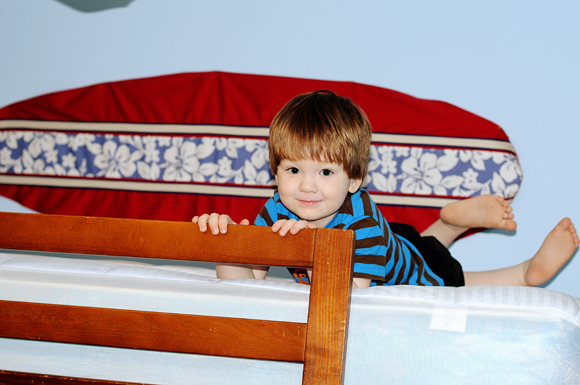 In the meantime, Jack will still sleep on the bottom bunk and is NOT allowed up there when that fan is on – or for that matter when Mommy or Daddy aren’t in the room. Yes, the ladder is safely hidden for now. Of course Colin had to give the bunk a test drive too. It was a hit! Jack had to scope out how far Colin would have to reach to get him. I think Jack is safe for now! I had to get one shot of the whole bed, bedding and all. I am not sure when the beds will be this tidy ever again. I asked Jack to lay down and pretend he was sleeping. He is such a great actor! Admit it – you thought he was zonked, didn’t you? 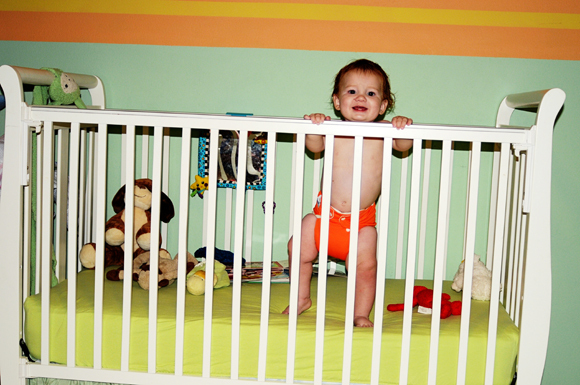 Then there’s my Colin – still happy to be chillin’ in his crib for a while longer. As much as I don’t want my babies to grow up too fast – I can literally taste the day when I can send that crib packing (another craigslist find)!! I can’t wait for all the extra space! Oh lordie – where have I been? Poor blog – you have been so patient! Where have I been? Well, here: http://emilymelsonphotography.wordpress.com/ for the most part. It’s been a busy but fun start to spring – oh, wait – it’s summer already? Dang, I AM behind! I guess you know that Colin turned one – I’m not THAT far behind. I actually had to look at my calender just now to make sure there wasn’t any big major event that I was missing over the past month – and as I suspected there wasn’t. I have just been that busy with work. It’s a good thing, though! Jack has started summer camp at his preschool. So, really, it’s just preschool but three days a week instead of two and since he moved up to the three year old class there are no naps. NO NAPS! Did you hear that? NOOOOOOOO naps! Ugh. Jack is such a napper but more than that he is a slave to his schedule – whether he will admit that or not, he is. He is used to napping 2-3 hours in the middle of the day where as now we get home from camp around 2:30 and it is the biggest fight ever to get him to lay down in his bed and often he doesn’t fall asleep until after 4 which means he wakes up around 5:30 or 6 and wants to be up until 10 at night. Ugh. You might say, “well, dim-whit Emily, just scrap the nap and maybe he will go to bed earlier”. Yes – I have considered that. My response would be – would YOU like to please come to my house and take care of my wild banshee of a three year old who hasn’t napped all day while I cook dinner, care for Colin, edit pictures and stay ‘generally’ sane? Didn’t think so. It isn’t pretty. You might not believe me but I have taken very few pictures of my darlings this month – no, seriously – I haven’t. However, so I don’t forget what they look like and so that they won’t go to therapy later in life for thinking I didn’t love them between May and June of 2010 – we went to the park and snapped a few the other night. It was a nice night. Who am I kidding? It was a hot and sticky night – as most are around here, but we went anyway. As you may recall – the above picture is my younger son, Colin. I know, it’s been a while so I thought I should catch you up. He is the sweetest child on the face of the earth and possibly the entire universe. 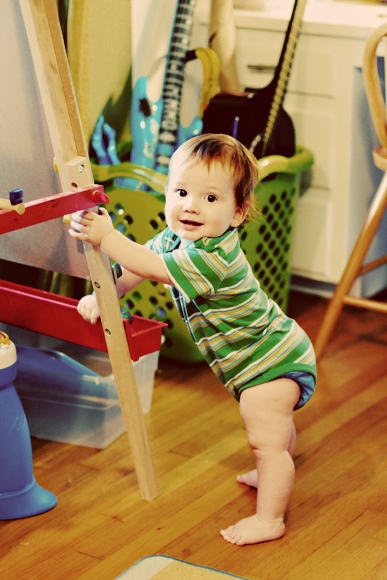 He crawls faster than Jack can run away from him and will pull up to standing when he is really motivated (i.e. he sees Mommy’s cell phone in the middle of the coffee table). In the past couple of days someone has taken the lead out of his feet and he has started to think about placing one foot in front of the other. He has only done it a few times but I think he is starting to clue in to the possibility of a new form of mobility (i.e. new ways to torture and annoy Jack). Colin LOVES blueberries and blackberries. His Mommy who has to wash his poop out of his cloth diapers does not. That is all I will say about that. When Alan gets home, Colin will race over to him yelling “DA! DA! DA!” He will, on occassion, when it isn’t too much of a bother refer to me as “Na-Na”. He doesn’t want to be burdened with having to close his lips to make the “M” sound. Who can blame him – that’s hard to for anyone. 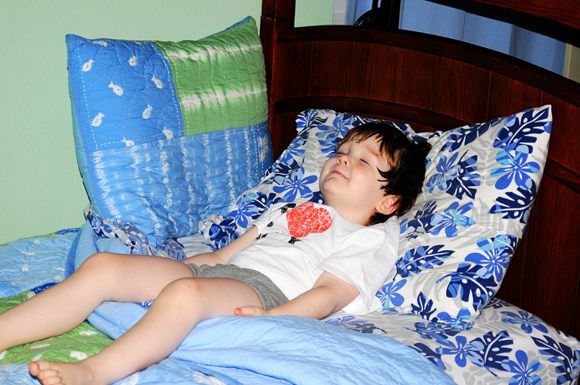 I will say that when he sees me in the morning or when I go get him from his nap – I do get MUCH bigger smiles and arm flapping than anyone else does! I’ll take it, for sure! Poor Colin (I often refer to him not as Colin, but Poor Colin as he often has to play second fiddle to big brother, Jack) rarely gets bathed (kidding – no CPS calls, please) and sometimes I don’t even change him out of his jammies, but he knows he is loved and adored by all that see him! Who can miss that insane RED hair? We love you, baby cakes! This is my Jack. What CAN’T he do? He is pure genius, I tell you! He can tell jokes, do magic tricks, use words like “indignation” (I had to spell check that, by the way) and “dignified”. He will tell you exactly what bad choice he made to deserve the chosen consequence. He can write his own name, although it’s backwards – he can do it! We are working on that. 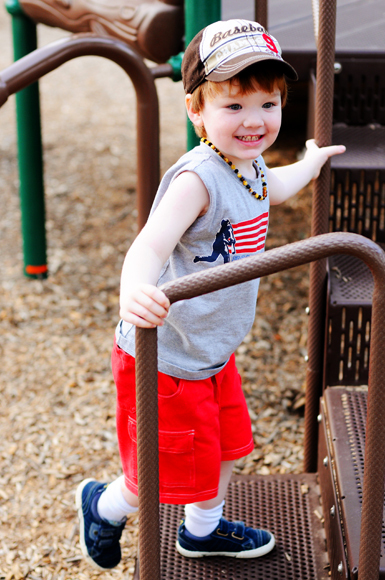 Jack can also count to 50 – and likely farther if Mommy had the patience to keep going. Jack can spell any word when looking at the letters and read the words “Jack”, “Colin”, “STOP”, “woof” and “meow” (and maybe a few more I am forgetting). The other day he actually sounded out the word “A-VEE-NO” correctly when I was putting sun screen on him before camp. This child also has the memory of three elephants and misses NOTHING you say – so be careful! He will bring up something you said in a whispered tone to someone in another room a month after you said it. Ok, maybe that’s a TINY exaggeration, but you get my point. 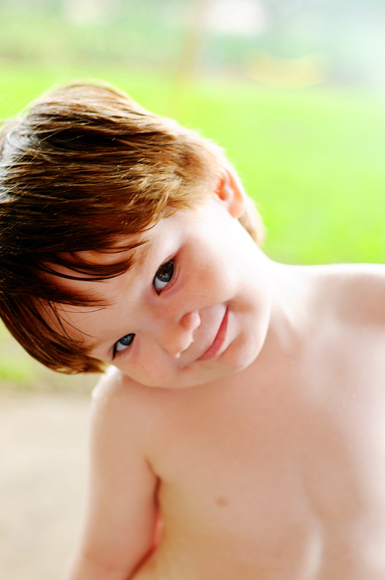 And, as many three year olds are – he is firmly in his “Why” and “What’s that” stage. Basically he NEVER stops talking!! God Bless him! 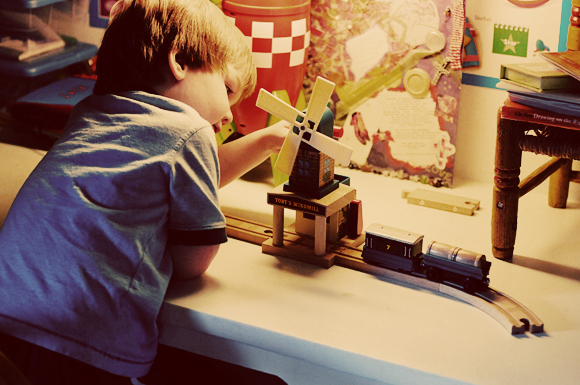 His favorite toys are still his Thomas trains followed VERY closely by his racecars. He knows about 3 NASCAR drivers by their car and loves to watch the wrecks on TV. That’s MY boy! He is just starting to really dig legos and since he had all of 8 of the Duplo blocks, I took pitty and bought him a small box. He will sit for a long time building carwashes, garages and of course – Texas Stadium! I could go on for hours – I love these boys. They are the light of my world and make every day happier and brighter. You’d be hard pressed to find a happier or more blessed Mama! Ok, I know we all say that – but you get it. All you mamas know what I mean. Thanks for being patient with me. I’ll try to not stay gone so long next time.